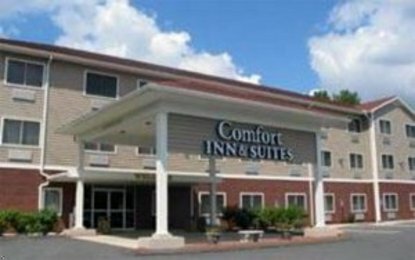 The hotel conveniently located off the MA Pike I-90, offering the mid-scale traveler a free deluxe continental breakfast featuring hand-made waffles, an indoor heated pool, free local and 800 calls, free high-speed Internet access in all guest rooms, cable television featuring HBO, in-room coffee makers, iron, ironing boards and guest laundry facilities for their convenience. Close to the area's finest attractions, including the Naismith Memorial Basketball Hall of Fame, Six Flags New England, The Eastern States Exposition, Springfield Museums at the Quadrangle, Yankee Candle and Old Sturbridge Village. Must have 1 adult 21yrs. or older in each room. No pets allowed. Pool will be unavailable January 21 through January 30.